The Vitarro Retractable Sunroof System uses intelligent German design, engineering and manufacturing to provide an effective means of sun control for conservatories, balconies and pergolas. Compact and elegant cocoon styled cassette ensures fabric, motor and running gear is completely guarded from the harsh environment whilst the system is in the fully retracted position. 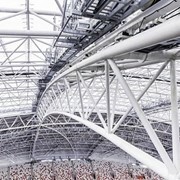 The patented return motion spring assembly system intelligently matches spring tension to the size of the fabric, this guarantees constant fabric tension is maintained throughout the cover at all times – making the Vitarro Retractable Sunroof arguably the most reliable system of its kind available. Components are manufactured from drop-forged aluminium, 6061 extruded aluminium and marine grade 316 stainless steel fixings, all with a superior double baked enamel powder coat finish.